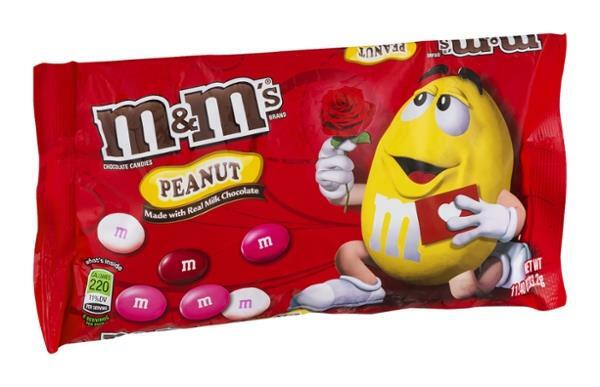 M&M's Brand Chocolate Peanut Candies. Made with real milk chocolate. What's inside: Calories 220, 11% DV. Per serving. 8 servings per pack. 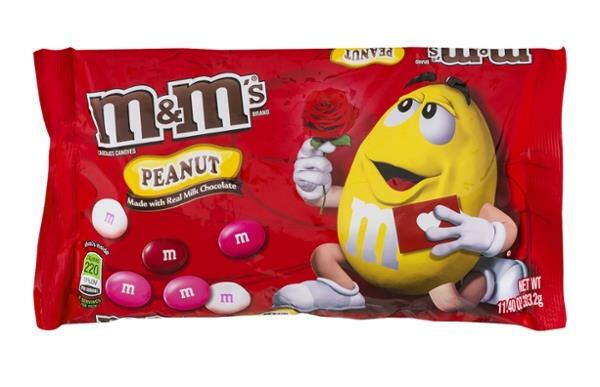 Milk Chocolate (Sugar, Chocolate, Cocoa Butter, Skim Milk, Lactose, Milkfat, Peanuts, Soy Lecithin, Salt, Artificial Flavors), Sugar, Peanuts, Cornstarch, less than 1% - Corn Syrup, Dextrin, Coloring (Includes Red 40, Blue 1, Yellow 6, Red 40 Lake, Blue 1 Lake, Yellow 6 Lake, Yellow 5, Yellow 5 Lake, Blue 2 Lake, Blue 2), Gum Acacia.